Stephanie Korenman joined Stern Tannenbaum & Bell LLP in 2012. Ms. Korenman had previously been Executive Director and Senior Counsel of Morgan Stanley Smith Barney, a senior associate of the Financial Markets and Securities Litigation groups of Duane Morris, LLP and an associate of Singer Frumento LLP. 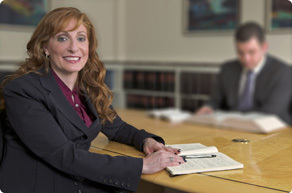 Ms. Korenman began her career at Robinson Brog Leinwand Greene Genovese & Gluck P.C. as an associate in its corporate group. Ms. Korenman is an accomplished broker-dealer compliance and regulatory attorney with extensive in-house and law firm experience handling litigations, arbitrations, SEC and/or FINRA regulatory investigations and enforcement proceedings. She regularly advises public companies and their executives, directors and affiliates regarding regulatory matters, corporate governance practices, SEC reporting and disclosure issues, enforcement matters, and securities transactions. She also counsels broker-dealers, investment advisers and hedge funds regarding registration, compliance, trading issues, litigation avoidance, disclosure policies and insider trading programs. At Morgan Stanley, she was senior counsel for the Executive Financial Services Department, where she managed the legal, transactional and advisory services for financial advisors and their corporate executive clients holding restricted, control or concentrated stock positions. Ms. Korenman is a graduate of the Benjamin N. Cardozo School of Law and New York University. Represented broker-dealer in appeal to the NASD National Adjudicatory Council, resulting in reversal without remand of adverse NASD district staff decision. Represented broker-dealer in NASD investigation of mutual fund market timing resulting in no action taken. Represented individual broker in New York Stock Exchange action arising out of the collapse of WorldCom, Inc., resulting in a favorable settlement. Represented syndicate captain of major brokerage firm in New York Stock Exchange investigation of manipulative trading in an IPO, resulting in a written determination to take no action. Represented witnesses in SEC investigations of Hollinger International and Martha Stewart. Represented individual registered representatives in NASD investigations of undisclosed outside business activities, resulting in no actions beyond letters of caution. Represented individual registered representative in NASD investigation of supervision of options trading, resulting in no action taken. Represented several broker-dealers in negotiating favorable settlements to resolve NASD investigations of net capital violations, underwriting escrow account violations, continuing education violations, and record-keeping violations. Represented individual officer of a public company in an SEC civil enforcement action, resulting in a favorable settlement of disgorgement of compensation but no other penalty. Represented and advised public companies in responding to SEC subpoenas both in particular investigations and in "sweep" examinations. Represented and advised broker-dealers in connection in NASD and NYSE routine audits and examinations. Represented individual broker in SEC administrative proceeding and trial. Represented investor in complex securities arbitration (over 20 hearing days) involving liability of clearing firm for fraudulent acts of an introducing firm. Represented a major broker-dealer and one of its analysts against a claim of financial analyst fraud, resulting in a dismissal of the arbitration at the close of claimant's case. Represented hedge fund customer bringing claim against a broker-dealer for improper taking of securities, resulting in a substantial award for client. Represented registered representative accused by customer of improper account activity, resulting in dismissal of case against client even though an award was made against his firm. Represented broker-dealer and independent registered representatives in numerous customer complaints, none resulting in an award against the client. Represented several broker-dealers in actions seeking temporary restraining orders, preliminary injunctions and damages against registered representatives leaving the firm and seeking to compete using confidential information and customer lists and in violation of non-solicitation and non-competition agreements, all resolved favorably to client. Represented individuals seeking to leave broker-dealers to start their own businesses, including pre-resignation counseling and defense of injunction actions brought by former employers, all resolved favorably. Represented private equity and hedge funds in connection with formation, regulation, governance and compensation issues, including strategizing optimal entity structures, negotiating and preparing appropriate agreements and documents, preparing private placement offering documents and assisting with required filings. Represented highly-placed brokers, traders and investment bankers in compensation disputes with their former firms, resulting in successful arbitration awards and favorable settlements. Prosecuted attorney malpractice action against major law firm, resulting in a favorable multi-million dollar settlement for client. Day Award for outstanding scholarship. Author, Morgan Stanley Smith Barney's "EFS Director Training Manual", part of the EFS Director Accreditation Program (complete revision, June 2010), a comprehensive and authoritative treatment of restricted, control and concentrated stock issues. Author, "Repeat . . . Executives Can Control Their Retirement . . . Repeat," Solutions Magazine (internal Smith Barney publication) (Winter 2008). Co-Author, "Trade Order Disclosure," Compliance Reporter, December 6, 2005. Co-Author, "The Selling Away Case: Rethinking the Firm's Defenses," Journal of Investment Compliance (Fall 2003). Co-Author, "How to Appeal SRO Enforcement Decisions," Association of the Bar of the City of New York, Self-Regulatory Organizational Practice (2003). Co-Author, "Regulation and Use of Electronic Signatures," American Conference Institute, Fifth National Conference on Securities Trading on the Internet (2001). Co-Author, "Implementing E-Signatures: Legal and Practical Considerations," American Conference Institute, Fourth National on Securities Trading on the Internet (2000). Contributing Author, "Misrepresentations of Secondary Actors in the Sale of Securities: Does In re Enron Square with Central Bank?" 59 Business Lawyer 975 (May 2004). Contributing Author, "New Ways to Make 'Em Talk: Real Time Enforcement, Sarbanes-Oxley and the Corporate Order," Journal of Investment Compliance (Winter 2003). Contributing Author, "New Developments in SEC Enforcement: Targets, Methods and Remedies," American Conference Institute, Securities Enforcement and Litigation (2002). Contributing Author, "How to Think About Electronic and Digital Signatures: A Tutorial From a Litigator's Perspective," American Conference Institute, Conference on Securities Regulation (2000).